Stroke. 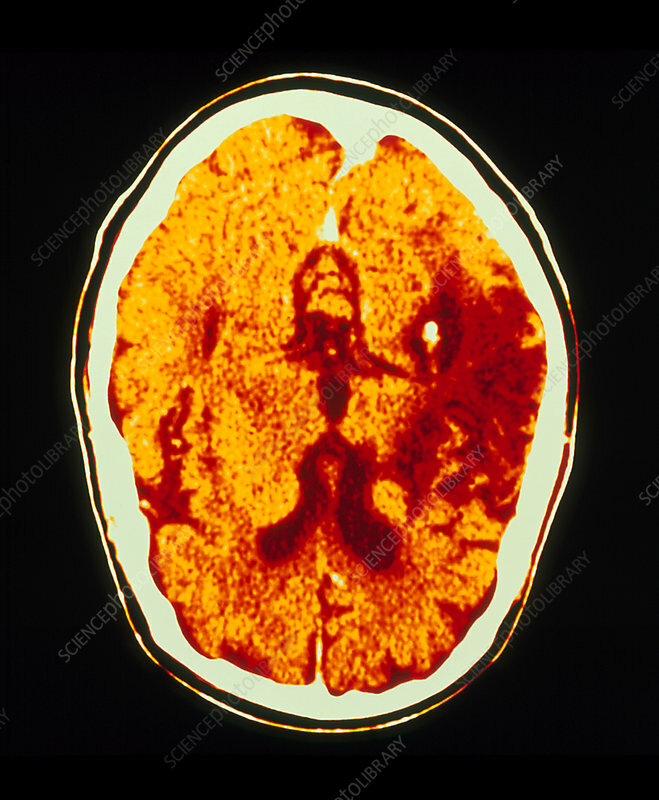 Coloured Computed Tomography (CT) scan of the brain seen in axial section of a patient aged 70, showing a cerebrovascular accident or stroke. At right is darkened tissue (red) where a blood haemorrhage has occurred with death of brain tissue. The extensive tissue death affects the right cerebral hemisphere, and is placing pressure on healthy brain tissue. Death of brain tissue (infarction) is due to inadequate blood supply. This may be caused by an obstruction in a cerebral artery due to thrombosis (blood clot). It may also be due to haemorrhage from a weakened artery wall. Stroke may result in paralysis or weakness on one side of the body, and may be fatal.